Price? 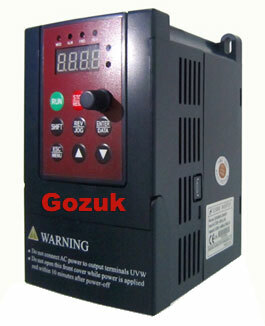 Check the price list for this 2HP/1.5kW drives. Tips: Why does a permanent magnet AC motor need a variable frequency drive (VFD)? The brief observations that follow will assume that a 2ph PM AC motor. In a PM AC motor, max continuous torque is achieved when the stator MMF (or current) vector is 90deg displaced from the rotor's flux vector. Recall the Torque = Rotor_Flux x Stator_MMF ... i.e. the torque is the vector cross product of the vector Rotor_Flux with the vector Stator_MMF, or Torque = |Rotor_Flux| * |Stator_MMF| * sin (theta), where theta is the angle between the two vectors. Torque is a maximum (and the typical desired operating condition) when the two vectors are displaced by 90deg. And torque is zero when the angle is zero. When a 2 HP PM AC motor is powered by a 2HP VFD (1.5kW), the PM AC motor sends its rotor position feedback to the VFD so that the VFD's microprocessor can ensure that the current (MMF) vector injected into the PMAC stator windings is always 90deg displaced from rotor's flux vector. When the PM AC motor is connected to the grid, the grid has no knowledge of the rotor flux position, and it cannot control the stator current from the grid to always be 90deg displaced from the rotor flux. Over the course of a line cycle, the average displacement angle is zero, so the average vector cross product will be zero. With zero average torque to accelerate the motor, the motor will remain at standstill and will just vibrate.